The Dragon Ball franchise is famous for many things, and one of them is its gallery of iconic antagonists. Piccolo, Vegeta, Freeza, and Cell are some of the big names Goku has faced over the years, and they each make a lasting impression. 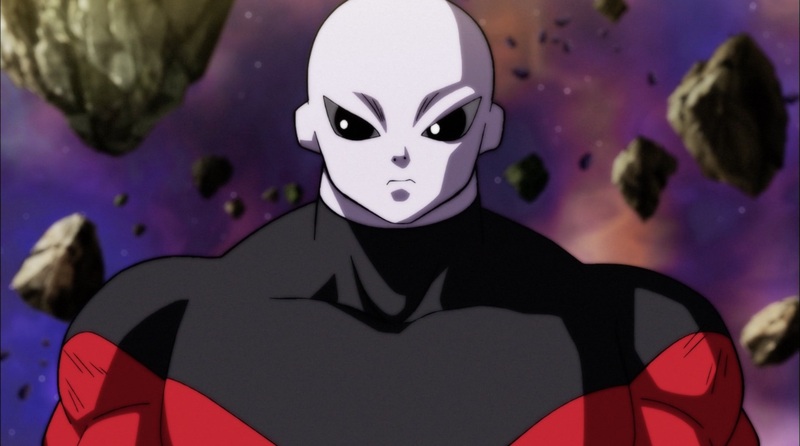 The recent Dragon Ball Super series introduced a major antagonist in its multiversal “Tournament of Power” arc, a mighty warrior from another universe named Jiren. But unlike the others, Jiren is considered by many fans to be a disappointingly generic villain. It’s an argument I can see, but in the end one I don’t quite agree with. Indeed, if you take Jiren as a villain, he seems to just be generic in his obsession with power and sacrifice–just another big body for Goku to overcome. However, this approach to Jiren’s character isn’t quite accurate: Jiren may be opposing Goku, but he’s not a villain. He’s a hero of his own world, one he presumably has defended from threats comparable to the ones Goku has faced, and he gained his power through the circumstances and decisions that comprise Jiren’s experience. The crucial difference between Goku and Jiren is that the latter’s life is full of pain and loss that made him choose a life of isolation and rejection. Where Goku would defeat and befriend those he faced, Jiren would destroy. Where Goku attains power for self-improvement and new experiences (i.e. fight stronger opponents), Jiren does it almost out of a sense of obligation or duty. Where Goku is goofy, Jiren is dead serious. What Goku has to overcome when fighting Jiren is not some evil machinations or even a chaotic force like Majin Buu, but a different in philosophy borne from a universe that did not have a Goku. Put another way, Jiren could have been the protagonist of his own anime or manga, one where suffering and cynicism dominate. Perhaps you can think of a couple of titles that fit the bill. But just like how Goku embodies certain values as the core of Dragon Ball, Jiren would be the center of his own narrative and all that such a scenario entails. So Jiren might come across as “uninteresting,” and he might not necessarily be as compelling a foe as the most well-known villains of Dragon Ball, but he acts as a different kind of foil. If ever he shows up again, there’s plenty of room to explore his character. 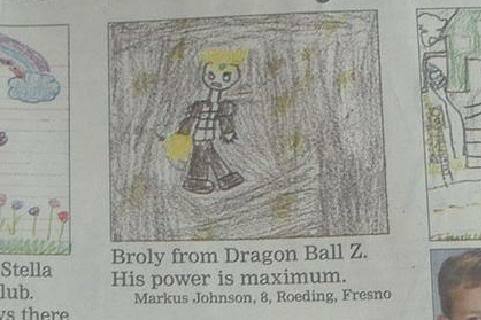 There’s an old and famous picture from a newspaper’s children’s section, where they asked kids, “If you could be a superhero, who would you be?” In response to this question, a boy named Markus answered, “Broly from Dragon Ball Z. His power is maximum.” But while people online have gotten lots of laughs from this innocent answer over the years, Markus’s words almost perfectly encapsulate the character of Broly, the Legendary Super Saiyan. As an antagonist, Broly was always a one-dimensional character whose primary trait is being ridiculously and impressively powerful. To be fair, the way it’s portrayed in his appearances leaves a lasting impression, and has a clear, primal appeal to Dragon Ball Z fans. However, he’s ultimately a simplistic villain to be overcome by blasting him harder. The character is also non-canon, appearing only in Dragon Ball Z anime films, which is why it’s rather significant that the creator of Dragon Ball himself, Toriyama Akira wrote the script for Dragon Ball Super: Broly. It not only means introducing Broly into the Dragon Ball universe proper, but also an opportunity to transform this flimsy rage machine into a fully fleshed character. On a skeletal level, Super Broly is basically the same character: an instrument of revenge for his father, Paragus, against Vegeta (the son of the man he hates most, King Vegeta), who goes berserk and must be stopped by Son Goku and his allies. There are a couple of crucial changes, however. First, in the original Broly film, Broly is shown as having an inadvertent deep-seated trauma caused by Goku when they were fellow infants, which causes him to wantonly attack Goku. This no longer is a thing, and when he and Goku fight as adults, they’re meeting for the first time. Second, in the new film, Broly is shown as being ridiculously strong and terrifying but ultimately innocent inside—as if his personality isn’t inherently that of a fighter. Both are smart choices that lay the groundwork for making Broly a properly three-dimensional character. The Goku grudge used to come across as largely a flimsy device to get Broly in direct conflict with the hero of the story, and it kind of punks out Vegeta in the process. Without it, his background focuses more on him being unfairly raised by his own father to be a tool for revenge, and the different ways in which Goku, Vegeta, and Broly have been shaped by their upbringings and experiences. An extensive background story in the first half of the film highlights these differences. That being said, I don’t want to make this film sound like a deep look into character psyches, as it’s mostly one gigantic fight scene full of the fast and frenetic combat Dragon Ball is known for. However, those crucial differences between Goku, Vegeta, and Broly come out even as they’re pummeling each other. Goku’s Earth-bases martial arts background, Vegeta’s elite Saiyan training, and Broly’s mostly unrefined berserker rage are all conveyed in the action, which does a lot of showing instead of telling somewhat reminiscent of Mad Max: Fury Road. A few bits of welcome comedy alongside some new characters help keep Dragon Ball Super: Broly from feeling too heavy—a clear indication of Toriyama’s hand in the process. Overall, it ends up being a really solid film, and one that manages to give depth and meaning to a pure power fantasy character like Broly without taking away the strength that made him popular in the first place. [APT507] Dragon Ball Super and the Tournament of Power: Combining Two Unlikely Story Narratives! I’ve previously made it known that I’m a fan of Dragon Ball Super. Now, I’ve wrote a post about why I think the latest arc, the Tournament of Power, is something quite special. Check it out on Apartment 507! In a recent blog article, I wrote about how the character of Vegeta in Dragon Ball Z is portrayed differently in Japanese and English, and how this has resulted in something of a divide among fans. The article was a surprising success, quickly becoming one of my most popular posts in recent memory, and the numerous responses I received (especially on Twitter) prompted me to think more about how Dragon Ball Z (and the Dragon Ball franchise in general) is perceived differently depending on how a person came across it. Before I delve more deeply, I do want to say that, while I prefer “Chala Head Chala,” my taste in music is not important here. Nor is the fact that “Chala Head Chala” came first. Tthe anime is based on the manga, which has no actual sound at all, let alone opening and ending themes. “Being the original” is not a sound argument to make. What I will be focusing on is mainly, how do each of those themes make its viewers feel? “Chala Head Chala” feels fairly light-hearted, with quite a few odd lyrics (“If I discover a dinosaur in ice, I want to balance it on top of a ball” ??? ), yet there’s also a quiet sense of gravitas thanks to Kageyama Hironobu’s warbling voice. While the theme does suggest action and excitement, it emphasizes more a sense of “adventure” and “discovery,” though perhaps not to the same extent as the Dragon Ball opening, “Makafushigi Adventure.” Most of the visual imagery in the opening is concentrated on movement—flying and running. Motion is the key. “Rock the Dragon” is all about heavy use of electric guitar riffs. The song puts all of its emphasis on high-octane thrills, and the the lyrics (as repetitive as they are) further push to the forefront the idea that this is not just a series with action, it’s the action series. Instead of the first image being a rotating dragon ball, it’s the dragon itself in all of its majesty and glory. All of the footage aside from that is fighting, fighting, and more fighting. If I had to greatly simplify, I’d say that “Rock the Dragon” is more about “body and spirit,” and “Chala Head Chala” is more about “heart and soul.” They both introduce the same overall series, about Goku and his allies taking on ever-increasingly powerful threats to the Earth, but one revels in the fighting and the other suggests fighting as a means of expressing character. Because of this difference, I think it cements different core images of Dragon Ball in people’s minds, and this affects how subsequent works (Battle of Gods, Dragon Ball Super) are received as well. Looking ahead, the opening of Dragon Ball Super, “Limit Break x Survivor,” is actually a kind of middle point between “Chala Head Chala” and “Rock the Dragon” with a dash of “Makafushigi Adventure.” Could it be the theme that unites Dragon Ball dub and sub fans once and for all? Does the Japanese “Vegeta” Voice Not Translate to English? Amidst the announcement of Dragon Ball FighterZ, a Guilty Gear-esque 3-on-3 fighting game based on the popular Dragon Ball franchise, one of the old debates between fans has cropped up: do you play with the Japanese voices or the English ones? Frequently, choices have to do with familiarity (what did you grow up on? ), as well as the divisiveness of Nozawa Masako’s performance, which some fans see as not fitting for Son Goku’s masculine appearance. English and Japanese Vegeta have a lot in common. They’re both extremely arrogant and prideful, and even their caring sides will be expressed through anger. However, I find that each of them brings a different feel as well. If both of their performances could be likened to boulders (big and powerful), then Sabat’s Vegeta would be rough and jagged, while Horikawa’s would be smoothed and polished. I’m beginning to wonder if the Horikawa-style Vegeta is somehow “lost in translation,” as if the effect doesn’t come across properly. The reason I’m considering this at all is that I also see other cases of similar characters coming across differently in English performances. One example is Meta Knight in Smash Bros., who sounds more like a noble knight in Japanese but has a deep baritone in English. (In the dub of Kirby: Right Back at Ya!, they went for an odd Spanish accent, but that’s more a directing choice than anything else.) Would the effect Horikawa has as Vegeta work better if a voice akin to English Smash Meta Knight’s was used? Another example is Kaiba Seto in Yu-Gi-Oh! In Japanese, Kaiba’s performance is more curt than anything else, like he has no time to waste on being nice or courteous. In English, Kaiba sounds more actively mocking and malicious. Would the former have not been as memorable? All of these different performances (as well as different scripts) can change people’s impressions to the point that they can almost be viewed as different characters. I’d like to believe that it’s possible to successfully translate the feel and intent of a character at least for the most part when dubbing a series, but I have to consider whether or not cultural context actually changes how a given voice “sounds” to a person. It’s not uncommon to see dub anime fans complain about all the “high-pitched voices” in Japanese, but fans of Japanese voices might lobby the opposite criticism towards dub actors making high schoolers sound like 40-year-olds. It’s almost impossible to get an “objective” opinion on how a character sounds across different languages, especially because the actors themselves will slowly evolve their performances over time. If dub Dragon Ball Z was ever able to perfectly adapt Horikawa’s Vegeta to English, would it actually have garnered him a somewhat different fanbase than he possesses now among English-speaking fans? Does the core character of Vegeta transcend voice, or is it a major factor in defining how the character lives? Surprising even to me, it turns out Dragon Ball Super is actually really good. I’ve written a small post detailing how Dragon Ball Super has improved upon its predecessors. Take a look! How much does time pass when the mighty Star Platinum punches an enemy Stand in JoJo’s Bizarre Adventure? There are many factors to consider, such as how much time has passed in the show itself, as well as how time is being manipulated within the series’ universe itself. Another important element is the fact that the anime is an adaptation of a manga, where the flow of time is abstracted by manga’s existence as a 2-D paper medium. As far back as Tetsuwan Atom, adaptations of manga have been a common mode of anime production. Manga act as a spring of new stories to present, and the jump from the comic book format to animation opens up many opportunities. An anime can try to forget its own path through interpretation or divergence from the manga (such as both the Ghost in the Shell films and Stand Alone Complex), or they can faithfully attempt to recreate what exists in the original. However, while the latter cases might often appear to be “direct transplants” of the manga to the screen, the act of having to take a physical and spatial image such as a panel and assign to it a finite amount of time can greatly change the impact of a given scene in spite of the desire for faithfulness to the source material. In a general sense, having to time dramatic beats for an anime often requires playing around with the contents of the manga. For example, in an episode of Dragon Ball Z, filler sequences (such as the infamous minutes-long powering up spots) not only save budget, but can also be a way to make sure the episode ends on a cliffhanger. On a broader multi-episode scale, Initial D: Fourth Stage does something similar by reversing the order of the final two opponents. Originally, the manga has protagonist Takumi race against a man known as “God Hand,” while his teammate Keisuke races against “God Foot” afterward. In order to make sure the series ends with a climactic battle for its hero, the show has God Foot go first instead. One consequence of this is that there can be moments when a series feels as if it’s dragging. Sometimes it’s successfully padded out or rearranged so that nothing feels particularly off, but in other instances it is possible to sense an uneven rhythm or pacing. This notion also extends to the transform of panels into time. Consider that there is generally no specific amount of time that is said to pass in a given panel in manga, or indeed comics in general. What makes a panel feel “fast” or “slow” is partially about how long one’s eyes linger on a panel, and it’s dependent on the amount of content there and the flow of the page. But because time exists differently in manga, things that seemingly pass quickly on the page take much longer on the screen. A common example of this would be the frantic explanations of special moves in an action or sports series. Because we tend to read more quickly than we speak, it is possible to believe that an elaborate speech or thought is being made within the span of a ball being passed from one player to the next. However, commit that to concrete time in an anime, and suddenly you begin to wonder why no one is doing anything as they talk for 30 seconds. To appreciate those moments, it requires a viewer to understand that time portrayed is not literal. This is the case even with series not adapted from anime. It does not “really” take Voltes V two or three minutes to combine together, or for Erika to become Cure Marine. So when what is a single, snappy panel in manga gets stretched out into an extended scene in an anime, it can dramatically effect how a person can feel about a particular title. I find this to especially be the case with comedy series. Take Azumanga Daioh, a four-panel series. In the manga, there will be a comedic moment that lasts for only one or two panels, such as Sakaki rolling on the floor while holding a wild Iriomote cat. In the anime, this becomes a full-on extended display of non-stop rolling with musical accompaniment. A small moment becomes a big one thanks to time. A more recent title would be Nichijou, where the staccato presentation of the manga’s gags are the equivalent of sharp, quick jabs. In anime form, however, the characters’ movements are exquisitely animated and exaggerated, and the result is a series that is in a way much more physical and almost “luscious” in a sense. While the Nichijou anime pretty much takes things directly from the manga, the two turn out to be pretty different experiences. My belief is that the unusual handling of the (broadly speaking) space-to-time transition of manga to anime is a likely culprit of why someone might love a manga but hate its anime (or vice versa!) even if the adaptation process is largely faithful. It’s kind of like when an actor is cast in a movie based on a book; what was once a nebulous image reliant upon visual/mental interpretation becomes a little more solid and finite.